This is the best recipe for Macaroni and Cheese we’ve ever made. 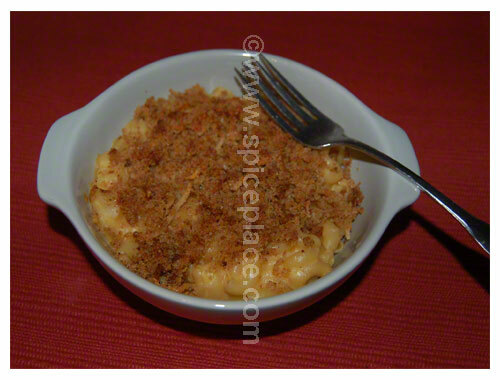 It has the essential quality that we feel a good Mac and Cheese recipe has that the cheese mixture absolutely sticks to and surrounds the macaroni. Look at the picture above and you’ll see how the cheese has spread well. 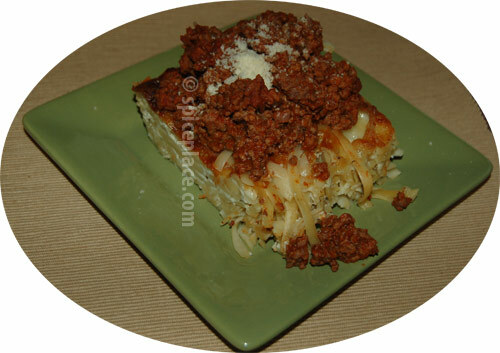 Try this recipe yourself and provide a comment on your thoughts please. 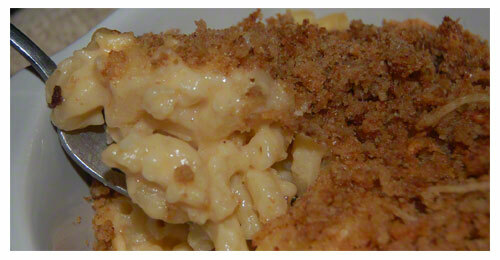 We believe strongly that this is THE Macaroni and Cheese Recipe. Melt the butter in a small non-stick skillet. Mix well. Remove to a small bowl. Set aside. Bring 3 quarts of water to boil in a large pan. Add macaroni noodles. Stir. Make a Rue: Melt 2 tbsp butter in a 3 quart non-stick saucepan. Add flour and stir until bubbly and the flour begins to lightly brown. Add milk to the saucepan, while stirring thoroughly to blend the milk and flour (a whisk works well). Heat slowly, stirring often until milk is hot and just near boiling. Whisk together well. Stir in cheese and mix until melted through. Mix in the nutmeg and cayenne pepper. Set aside, the pasta should be done at this point. Drain pasta well. Pour the cheese mix over the macaroni noodles and carefully stir to blend well. 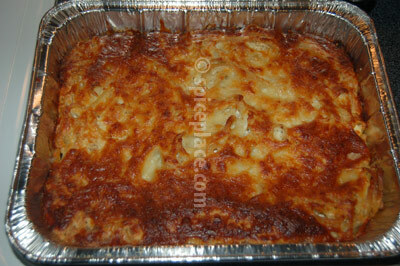 Spoon the cheese/macaroni mixture into 4 x 4″ diameter ramkins or similar sized oven safe bowls about 2″ deep. Top each bowl with 1/4 of the breadcrumb mixture. Place in the oven and heat until the bowls are bubbly 5 to 7 minutes. Remove and allow to cool for 4 to 5 minutes before serving. 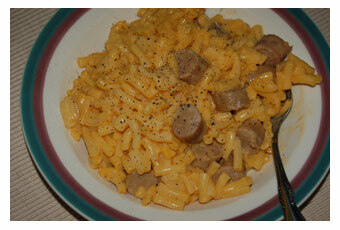 Ever since I was a child I’ve eaten Kraft Macaroni and Cheese for a quick lunch. I’ve tried the many different varieties of mac and cheese made by Kraft including the Velveeta, and instant squeeze cheese packets. But my favorite Kraft mac and cheese remains their original with elbows. One way that I make the Kraft Mac & Cheese is by adding two or three hot dogs to the boiling water along with the dry macaroni pasta. Both will cook together, and then when I strain the pasta, I separate the hot dogs from the pasta, and cut the hot dogs into 1/2″ sections, mix back into the pasta, and mix up with sauce. I always use real milk, and real butter, although not the 3 tbsp that the package calls for. Instead I use 2 tbsp butter, and 1/4 cup of warmed milk. To warm the milk, I simply measure into a Pyrex cup, and set near the stove while the pasta cooks. The butter, I simply slice, place in the bottom of the pan, and pour the drained pasta over top. Let this sit about 30 seconds, then stir to mix the butter around, sprinkle the pasta with the powdered cheese sauce mix, and add the mix, stir, and add the hot dogs. Let site 2 minutes to let the cheese sauce thicken. To serve, spoon the pasta into a salad bowl, and top with some fresh ground black pepper. As for the hot dogs, I buy Sheldon’s Uncured Chicken or Turkey Hot Dogs that are low in fat, and have no Sodium Nitrate in them. Since they’re not cured, Sheldon’s Hot Dogs must be kept frozen, and added to the water frozen. They taste good, don’t have the nitrates, and are lower in fat the most hot dogs. I just looked at the package of Sheldons Chicken Franks I have, and each frank has 7g of fat, 2g of which are saturated, and those are both 10% of the USDA Daily Value. That’s far less then the 36 – 40% values of normal hot dogs. You can find Sheldon’s hot dogs at the healthy food stores like Whole Foods or if your in central Maryland, where I shop, which is the Common Market in Frederick, MD off of Route 85 in Evergreen Square with Central Tractor Farm & Family used to be.